The adaptation of the Ibsen’s play was devised by Yagil Eliraz, Joshua Wren ‘14 and a cast of 10 actors, each of whom play the title character at points through show. “We are all Peer Gynt,” the actors chanted, some on stage, others surrounding the audience, all dressed in the signature red that coded them as the main character they all played. The house lights glowed as the audience shrank into their seats, trying to hide their discomfort with the subverted theatre norms. Nothing about this play followed convention, least of all the last 15 minutes. Norwegian dramatist Henrik Ibsen, best known for his more conventional play “A Doll’s House,” originally wrote “Peer Gynt” in 1876. It is a five-act play written in verse that lasts over five hours when performed in its entirety and includes over fifty characters across multiple continents. Yet, it is one of the most widely performed Norwegian plays. 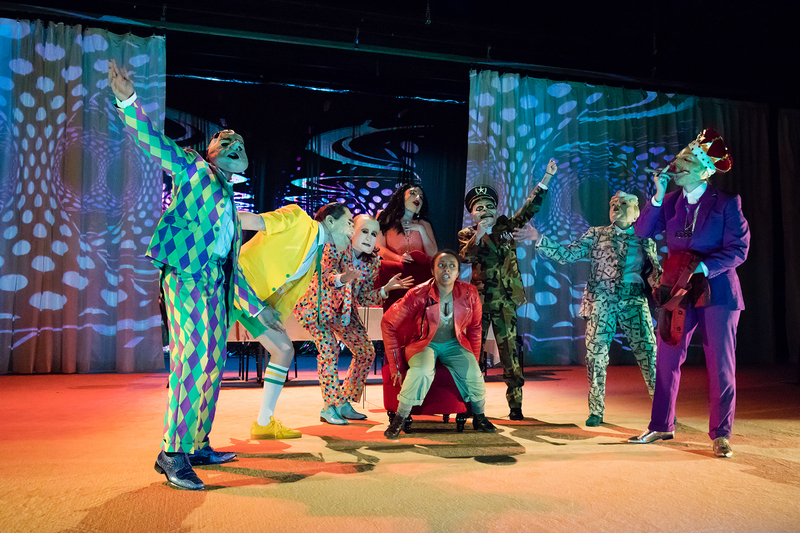 Theatre and Dance Assistant Professor Yagil Eliraz decided to bring an adaptation “Peer Gynt” to Amherst College for the department’s fall production. Eliraz said he almost did “Peer Gynt” as his MFA thesis at Yale but instead did the Oresteia. Ibsen’s play stuck with him, and since the department’s usual fall production director, Ronald Bashford, was on sabbatical, Eliraz decided to take this opportunity to put on the “Peer Gynt” production that had been living in his head for the last five years. The original story of Peer Gynt echoes “The Odyssey” in that the narrative follows one character — Peer Gynt — through a series of unbelievable adventures that each act as a unique episode within the overarching story. Peer starts off as an unpopular boy who lives in a fantasy world, desperately searching for his purpose in life and his true self. The lines between fantasy and reality blur by the third act of the play, which sees Peer become a rich slave trader boasting about his money. Throughout the play, Peer becomes a very selfish man who seeks more power and more money, not caring about who he screws over on the way. At the end, Peer is confronted by the “Button Maker,” a St. Peter-type character, who tells Peer that he did not live as his true self, was unjustifiably selfish and therefore will be melted down into a regular button, rendering his whole life meaningless. Eliraz and playwright/dramaturg Joshua Wren ’14 wrote the script for this production of “Peer Gynt” as an adaptation that “followed” Ibsen. After deciding on the basic structure of the play, they presented this “skeleton” of a script to their cast, who would devise and help write the rest of the play throughout the rehearsal process. However, some members of the cast did not feel as though the process was as collaborative as had been promoted. Mikayla Ybarra-Young ’20, who has worked with Yagil in the past, expressed concerns about the lack of input the cast actually had in the production. The cast consisted of 10 students, eight of whom were women, who each took turns playing Peer Gynt himself. The audience could tell an actor was Peer by the distinct red clothing, which consisted of a red hat and scarf for a time but also included a red velvet suit jacket and a sparkly red sari at different points in the play. The actors would also signal this change to the audience by approaching the edge of the stage and saying “I’m playing Peer now” to the audience, while also literally putting the Peer outfit on the next peer while onstage. This was the moral of the story that Eliraz and Wren made sure the audience left with. Throughout the show, the actor playing Peer Gynt would talk directly to the audience, defending his actions and coming to realizations that would move the play along to its next scene. No matter how deplorable his actions, such as seducing and abducting a woman on her wedding night and then dumping her in the morning, Peer always had an excuse to give to the audience. The first half of the production follows the original story’s scenes rather closely; however, Eliraz’s replaces the literal trolls that Peer encounters (a common theme of Norwegian folklore) with contemporary personalities that embody trolls’ values of selfishness as depicted by Ibsen. The actors donned plastic masks and exaggerated costumes as they played cartoon-like versions of Kim Kardashian, Donald Trump, Arnold Schwarzenegger, Vladimir Putin and Richard Nixon onstage. While the impressions were amusing, this was the first of many heavy-handed moments where the playwrights commented on contemporary issues. The second half of the show was where the production seemed to depart further from the original while also challenging the audience’s understanding of what was supposed to be “reality” and what was meant to be “fantasy.” After Peer’s mother dies, he is full of rage that the world could be so unfair as to take the only person he’s ever truly loved and he vows to get revenge. Peer swaps his career as a slave trader for the title of a “business tycoon,” which consisted of him bragging to the audience about how much money he has while the rest of the ensemble mime construction working behind him. Peer claims he is still not satisfied and contemplates colonizing land in Egypt as his next adventure. In this scene, the actor playing Peer sat upstage on an embellished cushion while smoking out of a hookah and wearing a fez. Behind him, half of the ensembles comes in dancing stereotypical “walk like an Egyptian” movements while dressed as pharaohs. The other half of the ensemble dressed as “belly dancers” wearing white dresses with hieroglyphics on them and black wigs with snake crowns. This Egyptian dance scene went on for quite a long time with no dialogue and ended with the ensemble declaring their devotion to Peer, the emperor of “Gyntiana” before marching militantly offstage. However, in his monologue after the Egypt scene, Peer decides that colonizing isn’t really for him; now he wants to become a religious mogul. It wasn’t until the post-show discussion that it became clear to me that this sudden shift was supposed to indicate to the audience that the previous scene didn’t actually happen and was just a fantasy in Peer’s head. The following scene, where Peer moves on to become a religious mogul, is equally strange, yet is meant to be understood as something that actually happens in Peer’s life, even though there is little that indicates the difference between these two scenes. In this scene, the actor playing Peer wears a red sparkly sari and huge black sunglasses as the cast tries to convince the audience to join their religion of the self. Hindu religion symbols and maneki-nekos (aka “Chinese Lucky Cat”) are projected behind him. Peer sells his new religion through memberships and books, and he scams people into becoming more selfish for his own monetary gain. These scenes stand out from the rest of the play as especially bizarre. Eliraz claimed that they are meant to to be satirical exaggeration of Peer’s simplistic, albeit racist, view of the world. The cast however, expressed anxiety about the problematic nature of these scenes and worried about the response they would get from the Amherst community. The play reaches a climax after Peer instigates a third world war in a confusing scene involving trade negotiations between the United States, China, Japan and Russia. The ensembles mimes a war scene as Peer hides behind a plush red chair on stage right. The actors all die onstage as Peer approaches the audience to tell them that he lost his entire fortune in the war, seeming to seek empathy from an audience not sure what to think about this character. Peer decides to go home where he is confronted by the button maker informing him of his imminent death and fate of becoming a regular button if he cannot prove that he lived to his full potential. Peer tries to find someone to vouch for him but realizes everyone hates him and won’t fall for his tricks anymore. begin to say in unison, facing the audience as the house lights come up, exposing us to the actors as they continue to debate whether or not their selfishness can be excused. This scene, called the “onion scene” by the actors, originally involved the actors throwing around an onion as they debated, each taking a turn peeling off a layer as they dissected the character they played together. The actors then entered the house and surrounded the audience as they continued this debate about morality. The onion was eventually omitted, though, in order to reduce the risk of audience injury. The debate concluded with the cast frantically asking audience members to come on stage and vouch for Peer Gynt. To everyone’s surprise, including Eliraz’s, many people did give in to the actors’ harassment and gave their opinion about the actor on stage. More than half of them supported Peer, asserting that everyone is indeed selfish and thus excusing his terrible actions. The play takes a jarring shift back into normal play mode for Peer’s death scene. Ybarra-Young plays this final Peer, who accepts his death and gives a dramatic monologue, which Ybarra-Young described as “cheesy,” about how he, Peer Gynt, will continue to live inside of everyone no matter what. Peer lays down to die, and the ensemble members, no longer dressed as Peer, roll him off stage as the button maker flicks a plain button into the air, letting it land behind him on the plain yellow carpet covering the stage.